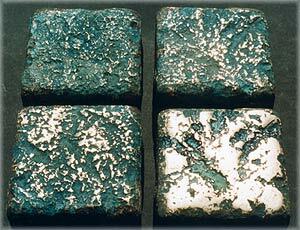 Four different stages in the wear and patination of the bronze paving stone, fluctuating back and forth over time. The wearing down of material is usually not favored. Something being worn down can, however, also tell something about the past and how the material was used. The bronze paving stone will make the use of the public area visible, without sacrificing long term durability because it is only the patination that wears down, not the actual bronze. The ground will become a changing photograph of the public life, as it passes over the public space. The polished bronze in one place will be a witness to the greater flow of people compared to the patinated bronze paving stones near by. On a sunny day, the polished bronze will cast many golden reflections around the area, enlightening the feet that polishe the bronze.